Oh time really flies at the moment and Christmas is just around the corner! Are you looking for a last minute Christmas present? Here you are. The Christmas Apple Jam is a really delicious and not too difficult to prepare. 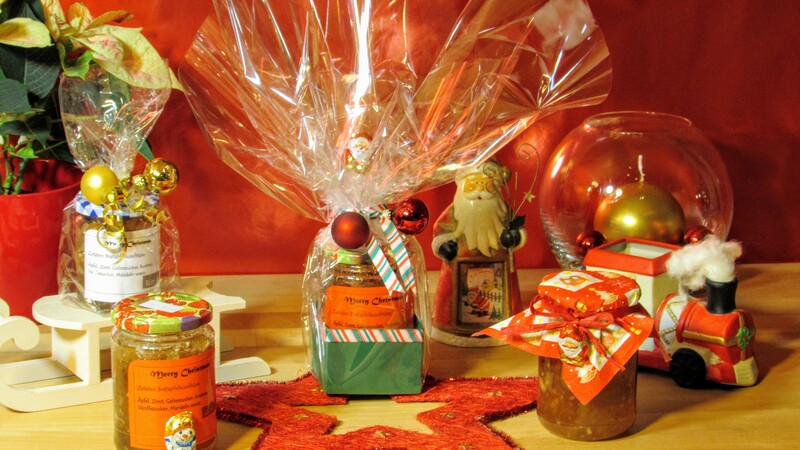 However, I recommend to set aside enough time, because it takes some hours to prepare the jam. If you serve the jam to children please substitute for example apple juice for the rum. 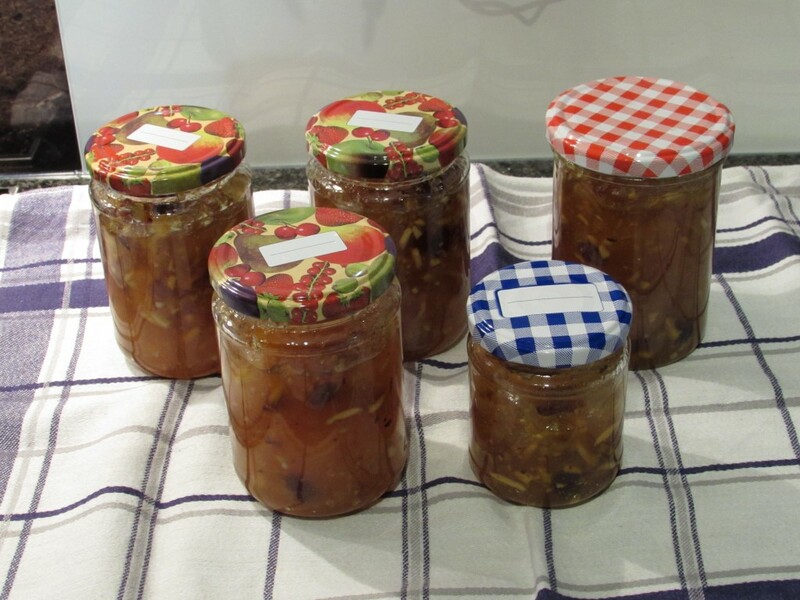 As I’m not very fond of raisins I use a mixture of raisins and cranberries to make this jam. If you don’t like raisins at all you can leave them completely off and use only cranberries instead and inversely. 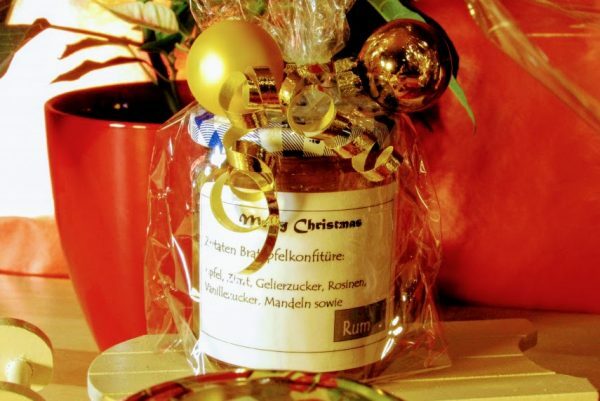 Wishing you a joyful Advent time with lots of happy moments and fun to make homemade presents such as this one. I hope you like this recipe! Have fun making your Last Minute Gift Christmas Apple Jam! Wash the apples, peel and core them. Finely cut them into apple wedges. Mix the Vanilla sugar with the cinnamon. Put the apple wedges into a large cooking pot. Fill in the mixture of vanilla sugar and cinnamon, the gelling sugar, and gently stir it. Cover your cooking pot and let the mixture soak for at least 3 hours. In the meantime mix the the raisins and the cranberries with the rum. 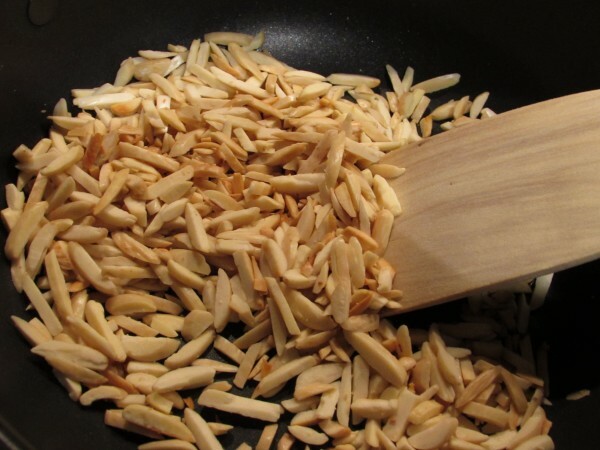 Put the almonds into a pan and roast them without fat. Using an immersion blender, chop the apples after 3 hours and add the roasted almonds to the mixture. Stir everything very well with a cooking spoon and bring this mixture to a rapid rolling boil (that is a boil which doesn't stop bubbling while stirring). Don’t stop stirring. When it starts rolling boil you have to cook the mixture for 4 minutes while stirring well continuously until the jam reaches its setting point. After 3 minutes add the mixture of the raisins, cranberries and the rum. Remove the cooking pot from the heat and take the cooking spoon out of it. Let the jam drain. If the last drop is set, your jam is ready. If not, return the cooking pot to the heat and cook the jam for a minute or two more and test again. To fill the jam into the jars a wide mouth funnel is really useful, because your jam very hot. Please fill it very carefully into the sterilized jars until it reaches 3/8 inch at the top and close the jars. Place the jars for at least 5 minutes upside down on a towel and finally place them upright to cool completely.